We’ve said it before, and we’ll say it again – in today’s competitive environment, customers are the most important players. Without them, many businesses would not have survived. However, today’s customers expect much more from companies, namely quicker service and products of exceptional quality. Businesses, therefore, must take extra care and understand their customers’ needs in detail. An effective solution for this is for businesses to implement a CRM system. CRM, or Customer Relationship Management, is a business strategy designed for companies to learn about their customer’s needs and manage customer relationships to maximize profitability and minimize expenses. A CRM system refers to the tool that businesses use in order to organize and develop interactions with customers in order to ensure the best customer experience and increase sales opportunities. The four points listed above lead to three valuable aspects for businesses. A CRM system helps companies gather and understand customer’s needs, leading to customer satisfaction. This helps a business to acquire new customers and also allows them to identify and retain existing customers. All this allows businesses to reward its loyal customers, develop a stronger relationship with them and develop better marketing initiatives. From customers point of view, the easiest a quickest way to provide feedback is through the web. OneDesk is entirely web based. With it, businesses can create a customer feedback application to gather feedback from their customers and even embed it in their website. OneDesk is easy to use and provides social collaboration tools so that businesses can bring customers into the development process, interact with them and pinpoint their exact needs. It also allows users to import existing Microsoft Project files, and integrates with existing CRM systems. 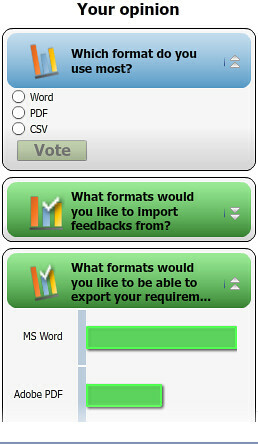 OneDesk allows you to import or export files. Poll your customers and find out exactly what they want.